We are pleased to be returning to Wortham Center this season. The Theater District Parking Garage is open for parking. However, renovation and repairs after extensive damage from Hurricane Harvey are continuing. We strongly suggest you consider other options. Important: As of April 5, the tunnel between the Theater District Parking Garage and the Wortham Theater Center has re-opened. Visit Houston First’s web site for the latest updates. We recommend Alley Garage or the new Lyric Garage at 411 Smith St. Lyric Garage will offer $10 event parking. Please note Lyric Garage is credit card only. Take the elevator to the M level. If you are returning after 11pm, you may have to enter the garage through the Lyric Tower lobby. Another garage option is One Market Square, located at 800 Preston St.
For the Dave Douglas concert on 4/12: We also suggest using the ridesharing service Lyft. Use the discount code JAZZ0412 for a $10 discount. Drop off is on Prairie St. Limited quantity available. $10 of credit available. Pickup or drop-off must be within the coverage area. Cannot be combined with other ride credit or offers. The best option to get from the Theater District garage to the Wortham Center is to take the stairs and go the street level at the corner of Texas and Smith, and then cross the street at the traffic light and enter Wortham Center from Fish Plaza. Or walk north on Smith and turn left on Prairie and enter the building through the Prairie lobby. One elevator in the garage may be operable. Trams will be available to shuttle those customers who need assistance. Customers should notify a garage attendant upon arrival, if they need this service. Da Camera Full Season (all 18 concert) subscribers will continue to park in the Alley Garage. o SP+ – which operates many lots and garages from NRG Park to downtown Houston. • Metered street parking information can be found HERE. Metered street parking is free after 6pm and all-day on Sundays. Remember these parking tips to avoid a parking ticket! • MetroRail is a great option. Visit their website for schedules and rates. 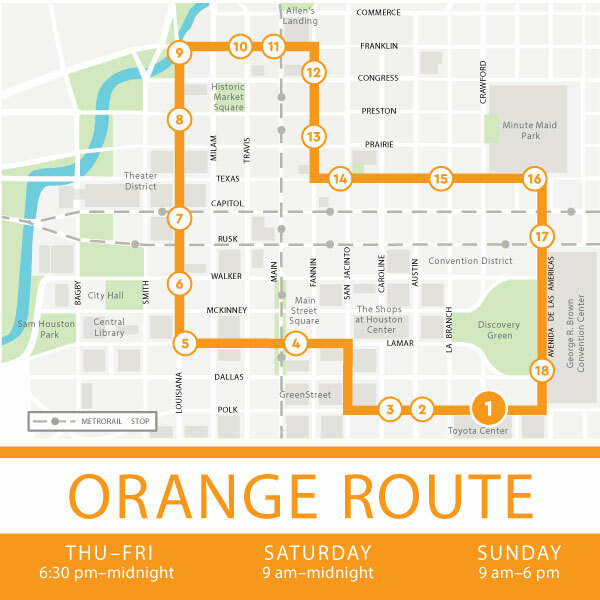 • GreenLink (Orange Route) is a free bus ride around the downtown area operating Thursdays-Sundays during specific hours. See the schedule for complete details. • Taxis are a flat $6 within the Downtown area. A great option if you must find parking further away from the theater. • Use ride-sharing apps like Uber and Lyft and to get to and from the theater. These may also help if you had to park a good distance away from the venue. • Use The Wave, a jitney service which operates Thursdays – Sundays. A jitney is a hybrid between a taxi, Uber and public bus. Read more about their services and see if they are right for your next trip to the Theater District. Questions: Please call 713-524-5050 or email boxoffice@dacamera.com. We will do our best to advise you.